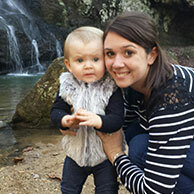 Kayleigh is a Cartersville native, currently residing in Euharlee with her husband, Joshua Downer, and their one-year old daughter. Kayleigh joined the Friends team after working for the DNR Park and Historic Sites division as an Administrative Assistant. Before that, she wored for six years a Program Coordinator for the City of Cartersville Parks and Recreation department. In her free time, Kayleigh enjoys kayaking with her family and exploring Georgia's state parks.